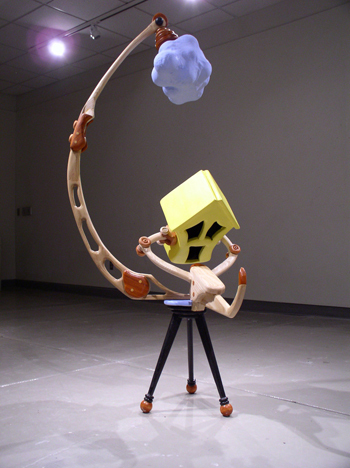 Dan Perry has exhibited his artwork in several venues throughout the country most notably, the Des Moines Art Center in Des Moines, Iowa, the Sioux City Art Center in Sioux City, Iowa, the Dangenart Gallery in Nashville, Tennessee, the Spiva Gallery in Joplin, Missouri, and The Haydon Art Center in Lincoln, Nebraska. Born in Omaha, Nebraska in 1979, Dan received his Bachelor of Arts degree in Fine Art and Mass Communication from Buena Vista University in Storm Lake, IA in 2001. Dan earned a Master of Fine Arts Degree in Sculpture from the University of Nebraska in Lincoln in 2006. Currently, Dan is the Art Studio Technician and an Instructor at the University of Northern Iowa in Cedar Falls. Of his work, Perry writes, "My work stems from attempts to recount and isolate events that have shaped my visceral responses. Through recollection, I try to determine how I learned to interpret emotions such as joy, lust, fear, and sadness by exploring memories of events that initially brought about those feelings. I begin my exploration with an inner dialogue that exists somewhere between my conscious and subconscious memory. It meanders through recollections of both personal and historic events that have been altered by continual exposure to disparate outside sources. It seems that the past determines the present, but the present also shapes the past as memories become distorted and twisted over time. The distortion of memories makes it difficult to distinguish between accurate recollections and imagined events. Influenced by film, cartoons, music, and science, the imagery in my work is an amalgamation of candid recollections and fabricated realities that allows me to delve into humor, fear, absurdity and the uncanny. I use materials such as, MDF (Medium Density Fiberboard), wood, plastics, and rubber predominately to construct my work, as they reference playthings from my youth. By revisiting, recreating, and interpreting, I wish to play with the connotations of these images, objects, and materials to better define my human condition."